If you missed it on Snapchat, I hosted a private shopping event at Banana Republic in Houston Wednesday! For those of you who may be newer readers of The Style Scribe, I actually started this blog while I was living in Houston over five years ago! It’s always fun to go back to where it all began… Unfortunately this trip was super short – I flew into Houston at 1:30pm and flew out at 11pm! As someone who does not work at a typical corporate 9-to-5 job, it’s a rare occurrence for me to wear a suit. With that said, I believe everyone should own one. Whether you wear the blazer and trousers together or pack them as separates when you travel, they are both super versatile pieces that can be worn day to night and for a variety of occasions. When partnering with Banana Republic this week, I got to try out pieces from their new pants collection and fell head over heels in love with the Sloan. It’s a tailored, skinny-fit pant featuring a mid-to-high rise waist (YES!) and the most comfortable stretchy fabric. If you’re not a fan of jeans (or you’re not allowed to wear them to the office), I beg you to try a pair of these. They run true-to-size and come in Petite, Regular or Long – I ordered the 6 Long and they fit me like a glove! I do want to mention that a few of the girls shopping at the event converted from the Sloan to the Avery, so that pair is also worth checking out too! I just can’t pull off a cropped pant, which is why I prefer the Sloan. 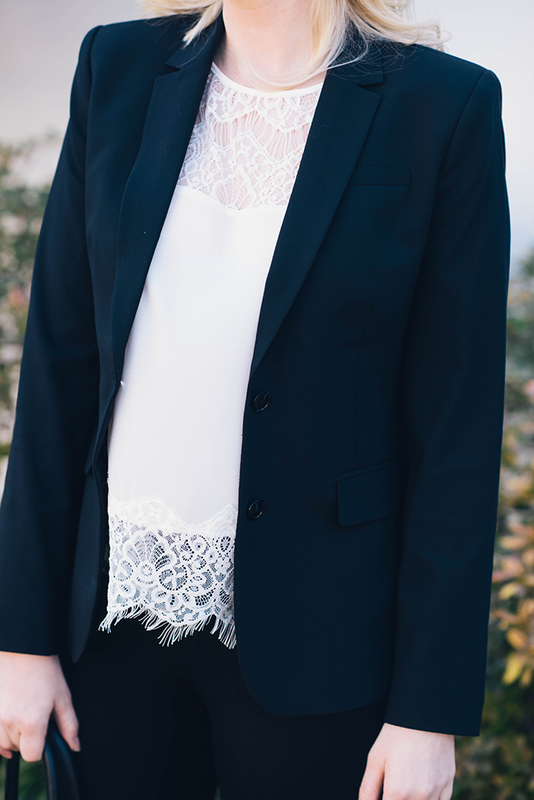 I have plenty of black jackets, but most of them feature special details or are made of leather – I have been without a simple, chic black blazer and figured it was time to to get one. This blazer looks great with my Sloan pants, but for a more casual look I pair it with a good tee and my favorite jeans! It lends a fresh, polished update to my everyday basics. Yay I hope the Banana event was a huge success! You look beautiful! I love your outfit! I actually just bought the Sloan style pants from Banana Republic last week and they’re amazing. Unlike most work pants that I used to own, I love how these fit and the fact that they don’t look baggy at all! So chic Merritt! I normally steer clear from suits at all costs, but I love the way you styled this with the lace top to make it feel more feminine and less Wall Street. I’ll admit, I’ve never owned a suit and I actually don’t even own a pair of slacks! You look gorgeous and this event sounds like a blast! I’ve recently seen the Sloan pant featured on Instagram and I was immediately intrigued! Thanks for the review. You can never go wrong with a classic pair of pants like these. The Avery fit sound tempting as well! Classic and perfect outfit. You look great. Perfect outfit for office. love that top and bag.